John: In this dream, I start off by going into a government building located in an area of the city I’m not familiar with. Something compelled me to leave my home and go to this place. Once there, I change out of my normal work clothes and into something more casual. I place my work clothes on a corner shelf in a safe place. However, I’m suddenly compelled to go to another government building, and I simply leave my things behind. I get so engrossed with what I’m doing in this new building that I don’t realize the time until it’s five minutes to 5pm (closing time), and I realize I’ve left my wallet, identification, and my clothes back in the first building. I know it’s probably hopeless to return and retrieve my things before that building closes, but in my panic, I rationalize that there may be a way to get in. I’m in a busy little city, but first I come to this huge hill that goes straight up in the air and then comes straight down. It’s like a tremendous loop, but you can’t imagine a hill being this steep. Then, as you come down, the road swings out into a hairpin turn, like on a roller coaster, and I no longer have any idea where I am. The odd part is, I saw this coming, I tried to avoid it, but I still get swept out into this sharp turn. By the time I come looping out of it I’m not even sure I’m in the city anymore. I was trying to maximize the five minutes, but obviously I’d have to know exactly where to go to have any chance to get in the first building again. So, I have to endure the inconvenience of not having my identification or clothes until the next time that building is open. As circumstances would have it, I meet up with a friend who works in the same building. He tells me about a group of employees who got into trouble. Something out of the ordinary happened and this group was accused of spying. They were arrested and then raped. He thinks there’s a possibility I could be accused of the same crime. It doesn’t make any sense to me because everything I did seems easily explained, yet at that moment I pause: I’m distracted as I look at the shirt I’m wearing. It’s a sweater that zips up from the center and I’ve been wearing it backwards, or inside out. I notice because I have to zip it up differently, i.e., I have to reach inside and use my fingers in a different way to pull it up. When I wrote this image up I thought, gee, this is the first time I’ve had a dream where I haven’t the foggiest idea what it’s going to mean. But then when I sat with it, I think I saw the deeper meaning. I think this is a dream that describes how changes in the future might unfold. And there’s the suggestion here that I’m caught in a time warp, or an in-between state, because how I’m able to be, and how I am, are two different things. First, there’s the aspect of being compelled to leave the comfort of my home, i.e., my comfort zone. Second, I enter a power building (it’s a government office) and get overly casual to the point where I forget my position, or get lost in it, and I end up wandering off to another government building. Third, because my attention is caught by looking at something in this new place, I suffer a kind of amnesia that has me lose track of the time and, ultimately, lose my way. The amnesia is a type of shock, and that shock is the inability to pull the two states together – the comfort zone and the new, unknown places. This inability to reconcile the two places in me is represented by the awkward, inside-out zipper. The friend from the same building, who shows up to help or guide me, in the sense of grounding me with something familiar, also portrays a worst-case scenario where I’m arrested for spying. But this worst-case would be the result of me “going back.” Yet after my detours, I’m not as concerned about going back, because my focus is on the inside-out sweater and zipping it together. In other words, I’ve left my comfort zone and fumbled around in the unknown by being a bit too casual in my approach. This causes me to lose my way – I’m not handling the new place very well and I face danger in returning to where I began. So the dream is showing me that these two states need to be pulled together within me. The future is an unknown territory, which always draws us away from our comfort zone. If we are too casual in this, i.e., we aren’t able to consciously hold our connections and inner stability (keep our wallet and identity) we put ourselves in danger of getting deeply lost. 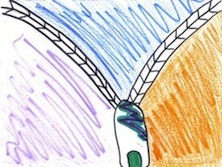 The relief I needed in the dream was seen as my plan for making the zipper work in its inside-out fashion. In reality, we humans live our lives from the outside in, forever in reaction-mode to the things happening in the world around us. In the future, humans will need to live from the inside out, in the sense that our connections to inner guidance, and our ability to process the higher aspects of ourselves – and bring those through into life – will be our main source of stability in a changing world. Thank you for sharing your dream and synopsis. It was very helpful to read this morning after my dream. This may be a stretch here, but see if this idea resonates that your higher self/subconscious may have been trying to tell you even more in that dream.